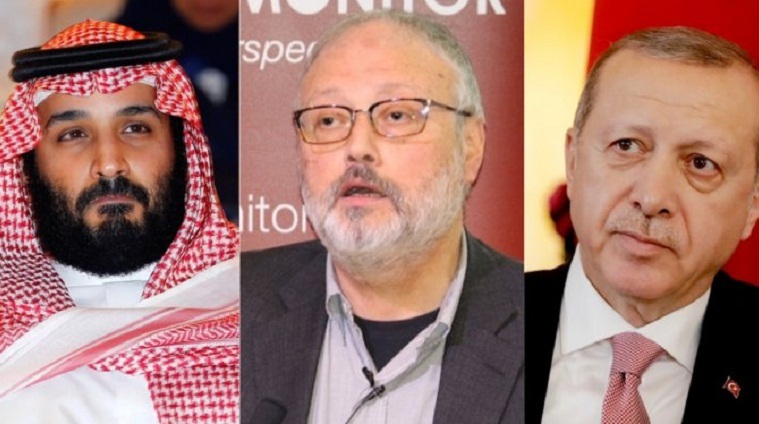 Turkey's pro-government media published new claims on Monday linking Saudi Crown Prince Mohammed bin Salman to the death of journalist Jamal Khashoggi after President Recep Tayyip Erdogan vowed to reveal the "naked truth" about the case. Erdogan said at the weekend he would give new details in a speech on Tuesday about the disappearance of Khashoggi, who was murdered almost three weeks ago after stepping inside the Saudi consulate in Istanbul. After over two weeks of near silence, Saudi Arabia has now admitted Khashoggi was killed in the consulate but the kingdom's explanations are seen even by its allies as contradictory and unsatisfying. The case has shone the spotlight on Crown Prince Mohammed, who has spearheaded a glitzy new reform drive for the kingdom but now faces a stream of allegations -- denied by Riyadh -- that he ordered the killing of the Washington Post contributor. US President Donald Trump, who has resisted pressure to curb arms sales to Saudi Arabia, initially said Riyadh's version of events was credible but then accused the kingdom of lying. Turkish pro-government daily Yeni Safak said Saudi security official Maher Abdulaziz Mutreb, the alleged the leader of the operation, called the head of Prince Mohammed's office, Bader al-Asaker, "four times after the murder". "The circle is tightening around the crown prince," said one of its headlines. Abdulkadir Selvi, whose columns in the Hurriyet daily are closely watched for indications of Erdogan's thinking, gave what he said were new details and said Prince Mohammed had to take responsibility. Selvi said Khashoggi was strangled by a Saudi assassination squad, in a process that took up to eight minutes. Then Salah Muhammed Al-Tubaigy, a lieutenant-colonel in the Saudi forensic department, cut the body into 15 pieces while listening to music. "We cannot close this file until the crown prince is brought to account and removed from his post. For 50 years we cannot live with a crown prince who is an enemy of Turkey," said Selvi. In the past weeks, Turkish media and officials speaking to international media have claimed that audio recordings prove Khashoggi was tortured before being decapitated although no concrete evidence of their existence have emerged. Several senior members of Trump's Republican Party said they believed Prince Mohammed -- who has close relations with the president's son-in-law and advisor Jared Kushner -- was linked to the killing. Senator Bob Corker called for a "collective" Western response if a link is proved. Erdogan has still stopped short of directly pointing the finger at Riyadh, with analysts saying he preferred to authorise the leak of incriminating information to pro-government media to pressure the kingdom. He has twice held telephone talks with King Salman on the crisis, with some analysts arguing Erdogan was seeking to preserve Turkish-Saudi relations through the ageing monarch while sidelining his headstrong son Prince Mohammed. Riyadh on Saturday finally admitted that Khashoggi had died in the consulate -- blaming a brawl -- and announced the firing of five top officials and the arrest of 18 others in a probe. Saudi Foreign Minister Adel al-Jubeir, the smooth former envoy to Washington and fluent English speaker, on Sunday appeared on Fox News to blame a "rogue operation" by individuals who "exceeded their responsibilities" and then "tried to cover up for it". "We are determined to find out all the facts. And we are determined to punish those who are responsible for this murder," he said, denying any link to the crown prince. Saudi's official news agency said both King Salman and Prince Mohammed had phoned Khashoggi's son Salah to express their condolences. Five employees from the Saudi consulate were testifying to prosecutors on Monday, Anadolu said, with 22 foreign and Turkish workers expected to give statements in total. The timing of the controversy could not be worse for the crown prince as he prepares to host a key investment summit on Tuesday, overshadowed by big name cancellations. Dozens of executives from bankers Goldman Sachs and JP Morgan to ride-hailing app Uber to Western leaders like International Monetary Fund chief Christine Lagarde have pulled out of the three-day Future Investment Initiative (FII), dubbed "Davos in the desert". Meanwhile German Chancellor Angela Merkel said Berlin would not export arms to Riyadh "in the current situation", despite Germany's approval last month of 416 million euros ($480 million) worth of arms exports to Saudi Arabia for 2018. In a rare joint statement, Britain, France and Germany said there was an "urgent need for clarification" on what happened to Khashoggi and Riyadh's account had to "be backed by facts to be considered credible".